← A summer spate …….. maybe? I passed Castlehill this evening on my way home and in little over a week it has been refilled to the brim. I am not sure whether this is overtopping or Scottish Water releasing water to generate hydro-electric power? I suspect that it will be the later. 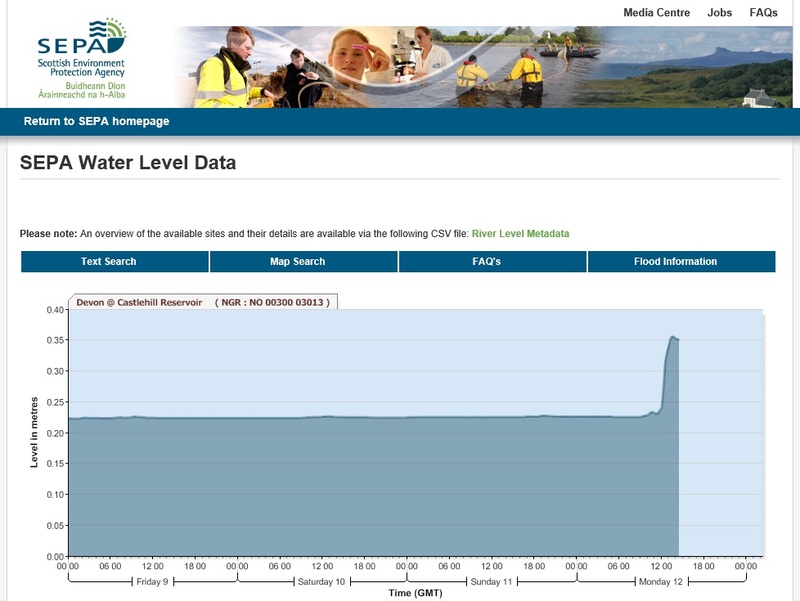 These small scale releases tend to come in rapid releases raising the river by about 10-15cm (similar to the profile shown). In some respects for the trout angler in the upper river they are welcome as they help clear some of the accumulated algae and silt but are no substitute for natural spates. Proper spate events on the Devon are obviously important to the salmon and sea trout population allowing them access to the river and ultimately their spawning grounds. They are however every bit as vital to our resident brown trout, as these events transport fresh sand/gravel deposits through the river system and removes accumulated fine sediment. This provides improved habitat for fish, the invertebrates that they rely on and fresh gravels for spawning redds. This entry was posted in River Devon miscellaneous, River fishing, River journal. Bookmark the permalink.